The Gender Report provides a regular round-up of links to online articles that may be of interest to our readers. The links below are to recent noteworthy articles on topics related to women in journalism, media and technology, as well as articles related to the intersections of gender, race, class, nationality, ability, and sexual orientation and the media. Articles included in this feature do not necessarily reflect the views of The Gender Report or its writers. View past week’s round-ups here. Check out the Women’s Media Center’s new infographic by clicking here. –CoverIt Live Feed: Conversations in Journalism 2014 #cij14. (The Columbia Journalism School Women in Journalism) The organization held its first student-organized conference on Saturday, April 5th. An article in The Nation related to online feminism sparked a lot of discussion this week. Here is a link to the original piece as well as some of the responses. For additional responses, be sure to check out the hashtags #IStandWithKarnythia & #femfuture on Twitter. A new report from the Women’s Media Center draws attention to persistent and pervasive gender gaps in U.S. media. The report, titled The Status of Women in U.S. Media 2013, provides a thorough summary of recent findings and studies pertaining to women’s representation in the media over the past year. It includes findings related to newspapers, television, radio, film, social media, literature, and video games. WMC released a similar report for 2012. This years report points to a number of findings we’ve also featured on our site over the past year, including that the percentage of women in U.S. newsrooms has remained unchanged at 36.9 percent since 1999. 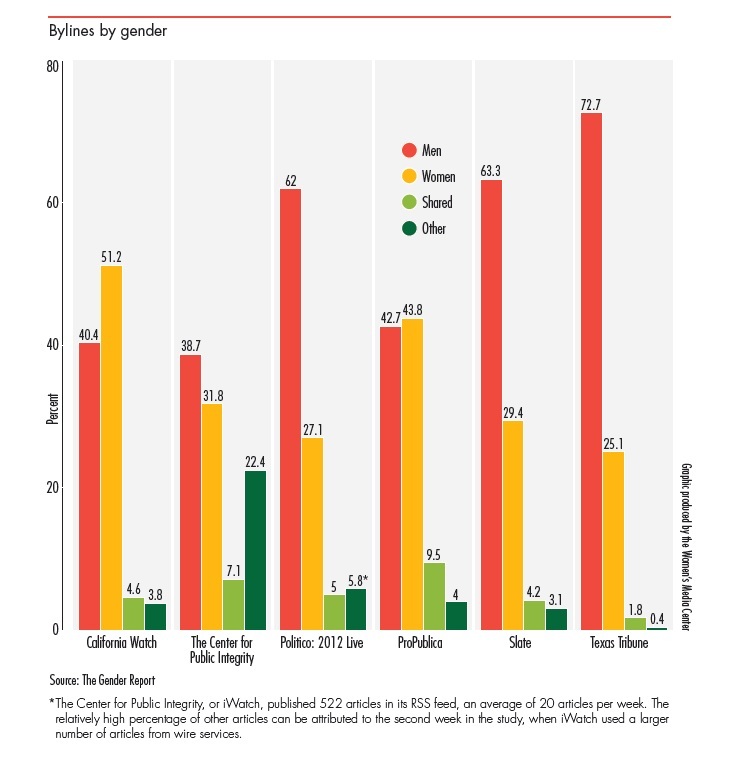 Our Byline Report study, which looked at the gender breakdowns of bylines at six online-only news sites, is featured in the report. The study found that male bylines outnumbered female bylines four out of the six websites we examined during our six-month study. As the WMC report notes, “Newer, online-only news sites have fallen into the same rut as legacy media.” You can read about our findings on pages 20-21. Download and read the full report from the Women’s Media Center here.